Very impressive beautifully handpainted full bodied tropical scene depicts an underwater view of 8 dolphins near a coral reef with various other tropical fish completing the design. The handle and border decoration are detailed with shellfish. The top of the pewter lid is an inlaid stoneware figurine of 3 jumping dolphins. 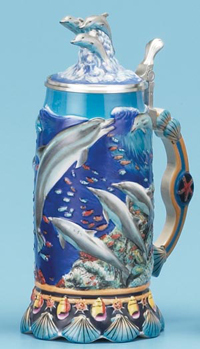 This is one of the most vividly colored steins ever to be created. This stein is about 11 in. tall, This is the Last One.